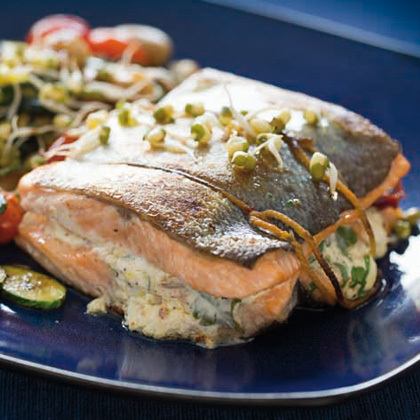 For the trout: preheat the oven to 190°C. Mix together the cream cheese, pine-nuts, garlic, horseradish, spring onion,lemon juice, sun-dried tomatoes and basil. Place one side of the trout on the baking tray, skin-side down. Spread the filling over the trout and top with the second piece of trout. Secure lightly with kitchen string. Heat the oil in a pan over medium heat and carefully fry the trout on both sides, one minute each side. Transfer to the baking tray and place in the oven until cooked to your liking, 10 – 15 minutes. When cooled, slice the trout into thick pieces. For the salad: heat the butter and oil in a pan over medium heat. Stir in the tomatoes and onion and fry for one minute. Add the sliced baby marrow and butter beans and lightly fry until tender, 3 to 5 minutes. Season with salt and pepper and toss in the vinegar and parsley leaves. Serve warm and garnish with sprouts or micro-greens.